Wader Quest: Good news for Lars Jonsson fans. Good news for Lars Jonsson fans. Wader Quest has been able to secure 26 signed copies of the new Lars Jonsson poster showing some winter birds to be seen in Sweden. 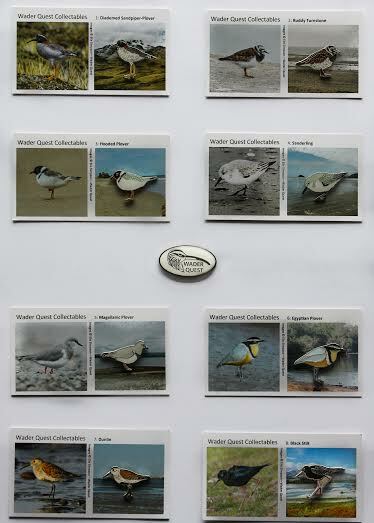 These are available for purchase through Wader Quest at a price of £16.00 each plus post and packing (UK £6.89). We will not be able to reserve copies without payment but will release them on a first come first served basis and one per person, so you had better hurry as we suspect they will fly off the shelf. Don't forget, while you are at it, we now have 8 Wader Quest Collectables pins available at £2.00 each; Diadememd Sandpiper-Plover, Ruddy Turnstone, Hooded Plover, Sanderling, Magellanic Plover, Egyptian Plover, Dunlin, Black Stilt and of course the Wader Quest logo pin badge. Details here with other items for sale such as earrings and fridge magnets.